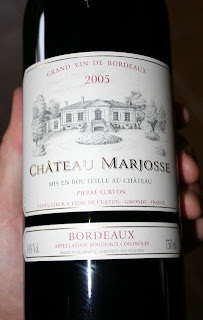 I ordered this 2005 Bordeaux from Wine Library way back in January as a presale. It was supposed to come in some time last June but it didn’t arrive until just yesterday. I’ve been dying to taste it. Some of the tasting notes on cellartracker for this wine are mixed. One guy even gives it 74 points because it has tannins! Not sure what to think of that review. Well, tonight I opened a bottle and I’ll give you my opinion. Color: Deep, deep inky purple color. Looks young and will probably taste young. Nose: Dark blackberries and black raspberries hit the nose. There is almost a sweet smell that reminds me of chocolate and coconut. It has some earthy notes with alot of complexity going on there. Palate: Solid firm tannins that are gripping! It is definitely too young to drink and I can understand why people turn off to this. The tannins overwhelm the palate. However, this wine is full of vegetables mingling with those dark fruits. It has a nice balance of acidity. The alcohol is a little out of balance providing for a hotness that exacerbates the tannins. The earthy peaty fruit fills your mouth, though, with big robust flavor that lasts for days on the palate. I think there is a lot there and can’t wait to taste this 5-10 years from now. This wine has a lot of potential to evolve into something quite nice. It could, however, fall flat after aging if the fruit doesn’t stand up to the high 14% alcohol. I can see this wine pairing very well with mushrooms and truffles. I should mention that I just popped the cork and tasted this one. I’ll give it some time in the decanter and see if it improves. Given it’s potential, I would probably give this one 90 points. That may change in a few years. Time will tell. 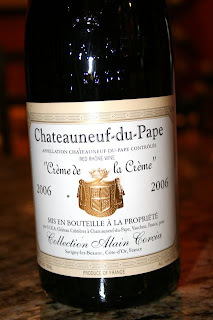 Our AWS chapter will be tasting Rhone wines next week and I picked up this Chat du Pape for the tasting. I thought I would give it a go before the get together to see how it is. The color is a gorgeous deep ruby red with purple tinges. Hints of youngness are apparent in the color. It is dark and you cannot see through it. The nose is unusual with some very subtle hints of red cherries mixed with herbs, vegetables and eucalyptus. On the palate there is a nice body and heaviness that wraps around the mouth. Very complex with flavors of mint, red raspberries and green peppers. It has a nice balance of tannin and acidity. It is nicely structured and rock solid. This is a delicious wine that should improve over the next 5 years. I would rate it 90 points.